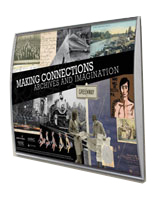 Wall Signs are Available in Various Sizes in This Online Catalog. Each Frame Features a Neutral Silver Finish. 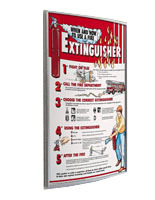 Browse Additional Wall Signs and Supplies Here. 6" x 7.5" 6" x 8.5"
Made from silver, anodized aluminum for an upscale appearance. 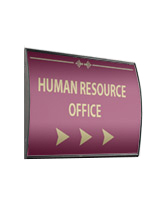 These directory displays, wall signs will command attention no matter where they are placed. The frames are perfect for use in any high-traffic areas to display room numbers, directories, department name or warning signs. 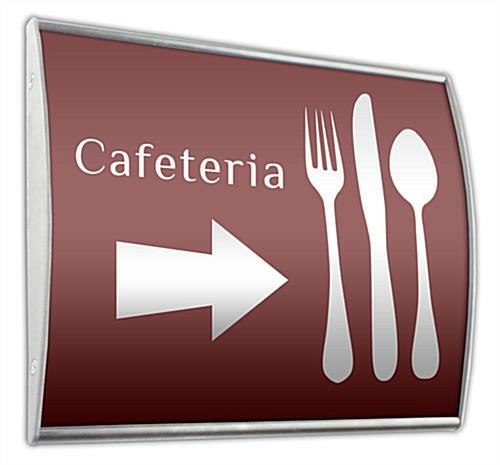 These cheap wall signs can also be used as a wayfinding signholder, to lead clients or patrons through your establishment. Each of these units are often found used in places like hotel lobbies, business offices, hospitals, convention centers, banks and universities, just to name a few. These wall signs for business use, also called indoor signage, are durably constructed from silver anodized aluminum for longevity. The contemporary design, combined with a neutral silver coloring, enables these frames to easily coordinate with any environment. 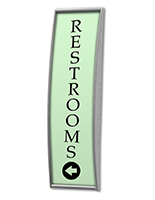 Graphics can be changed with ease, when using the included suction cup. 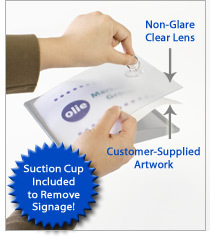 Each of the aluminum wall signs comes with a suction cup to lift the non-glare lens allowing placement of your graphics underneath. 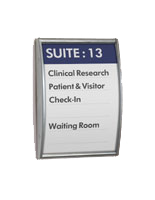 This design allows customers to update or change the displayed information with ease. These wall signs that include double-sided tape do not come with graphics. 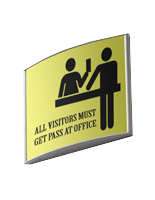 However, customers can easily print custom signs using any type of printer. These name plates, in combination with eye-catching prints, are a perfect way to direct guests or visitors through your establishment. 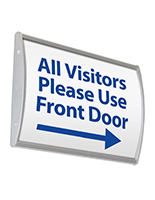 The wayfinding signholders are also easy to wall-mount, when using the supplied, double-sided VHB tape on the back of each frame. 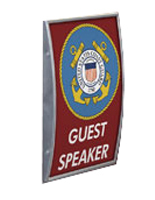 These name plates can be affixed to any flat surface, both horizontally & vertically.